As affiliate of TCT, you have 2 kinds of earning potential. You get paid money for promoting TCT. However, you not only make money when someone joins TCT through your affiliate link, you also make money when those affiliates promote TCT as well. 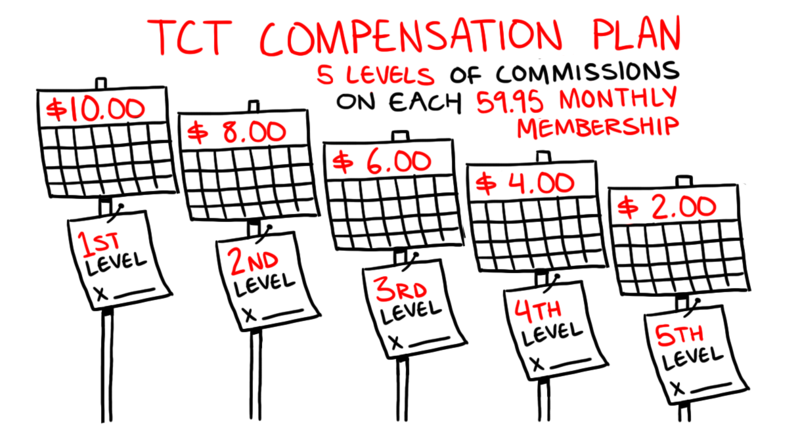 In fact, with our multi-tier compensation plan, you get paid out on 5 levels in recurring affiliate commissions. Let’s say you have an email subscriber list and you send out an email promoting TCT. And 1 subscriber signs up as a TCT member. Awesome! You get paid $10 every month while they are an active member. Then if someone joins TCT through THEIR affiliate link, you get paid $8 for their referral. In total, your opportunity to make recurring affiliate commissions is available 5 levels deep. So, as you can see here, you can make between $10 - $2 every month for every active member in your 5 level downline. Now, the 2nd part of your affiliate earning potential, which is ONLY available to UPGRADED members, comes in the bonus traffic you receive. 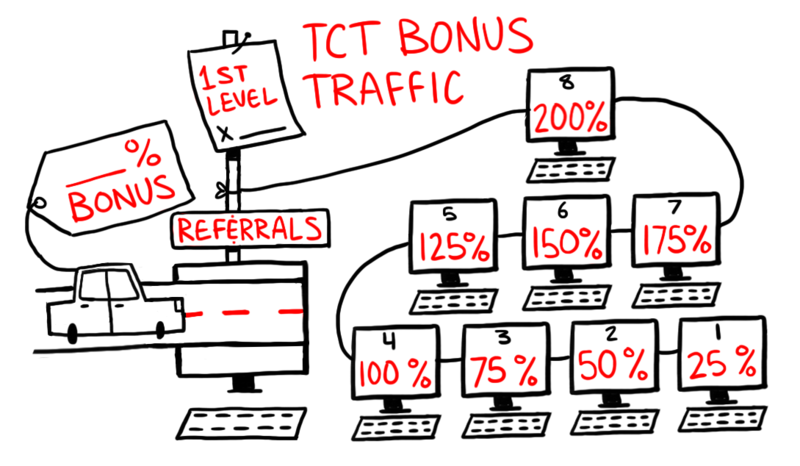 As an UPGRADED member, on top of making extra money as an affiliate of TCT, you can also earn bonus traffic for those who become active members directly through you. Here’s how it works. Going back to the email subscriber example - when that 1 subscriber signs up as an active TCT member through you, they become your 1st Level referral. And in addition to earning $10/month on that member, your links in the traffic shifter will receive 25% bonus traffic. Now, if you refer two active 1st level members, your links in the traffic shifter will be getting 50% bonus traffic. 3 active 1st level members = 75% bonus traffic. 4 active 1st level members = 100% bonus traffic. And so on, up to 8 active 1st level members… totaling 200% bonus traffic. The highest bonus traffic you can receive is 200%... even if you refer 20 members. But keep in mind, as more members join, they will inevitably help TCT grow by adding their own new links and offers, which means more opportunities for you to make more money.